The SportWagen makes a great cross between a traditional car and an SUV. It has plenty of cargo space. The rear seats fold down for even more storage. However, this vehicle is still low to the ground, and it handles more like a car than like a truck. The SportWagen also features elements that add a hint of luxury, like a power tilting and sliding sunroof. Roof rails make it possible to transport skis, Christmas trees, kayaks and more. To really understand this versatile, agile vehicle, you'll want to drive it. Come and see us at Sheehy Volkswagen of Springfield. 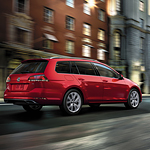 We'd love to put you behind the wheel of the flexible, driver-friendly Volkswagen SportWagen.